Hirabai Barodekar is one of the renowned classical artistes from Kirana gharana. Born in 1905 in Miraj, Maharashtra, Hirabai's musical training started whilst she was still a child. She was the daughter of legendary vocalist Ustad Abdul Karim Khan from Kirana gharana. She received her initial training from her brother Sureshbabu Mane and later trained under the doyen of Kirana Gharana, Ustad Abdul Wahid Khan, who was a cousin of her father, Ustad Abdul Karim Khan. Hirabai was gifted with a melodious voice. Besides classical Khayal singing she had mastery on light classical music such as Thumri, Bhajan and Marathi Natya Sangeet. She popularized Hindustani Classical Music among the masses. Hirabai was also a fine stage actress. Her elegant features and her fine singing voice were her greatest assets. She was the first woman to appear on the professional Marathi stage. To Hirabai goes the credit for having introduced classical music in the place of light music in Marathi Natya Sangeet. Hirabai acted in several movies, including 'Suvarna Mandir; 'Pratibha; 'Janabi' and 'Municipality: She also started a music school, 'Nutan Sangeet Vidyalaya; to teach music to girls. She was the recipient of the Padma Bhushan and the Sangeet Natak Akademi Awards. Dr. Prabha Atre, Saraswatibai Rane, Malati Pande, Janaki Iyer, Shaila Pandit and Suvarna Chandrashekharan are some of the talented women singers Hirabai left behind as her musical legacy. The Vedas, one of the oldest Indian scriptures have been the seat of Indian Classical Music. Indian Classical Music is also said to have been influenced by Indian folk music. Being both, elaborate and highly expressive, Indian Classical Music has withstood the onslaught of time and various cultures. The pages of History also indicate the influence of Persian music on Hindustani Classical Music. Based melodically on Ragas and rhythmically on Talas, this rich legacy lays emphasis on exploring the ragas and expounding the finer nuances of the same. The proud history of Saregama stretches back over a century to 1901. Formerly known as The Gramophone Company of India Ltd. and more popularly as HMV (His Master's Voice), Saregama was established as the first overseas Indian Branch of Electrical & Musical Industries Limited (EMI), London. From producing the first song recorded in India in 1902 by the star of yesteryears, Gauhar Jan, today Saregama has evolved into one of India's premier entertainment content companies. Saregama India Ltd. is the custodian of over half of all the music ever recorded in India. Saregama has the largest music archive and catalogue in India. Each of the artistes featured in this series is a legend and has contributed greatly to putting Indian Classical Music on the global map. Having imbibed musical knowledge in the Guru - Shishya parampara, they continued the tradition with their students too, thus building on the rich cultural heritage, generation after generation. In this exclusive series aptly named 'The Great Heritage Series; in its own inimitable style, Saregama brings together the wealth of Indian Classical Music, the artistes' legacy and its own brand equity built over the years. 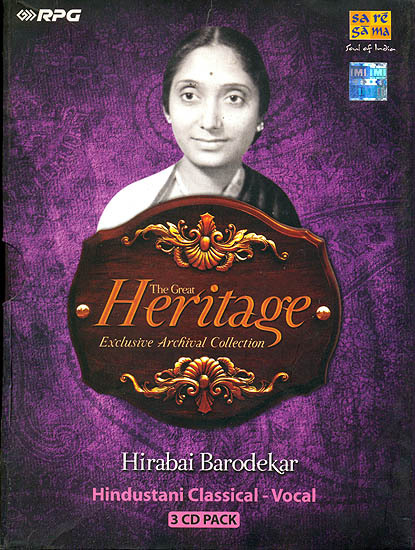 In this exclusive series, Hirabai Barodekar's archival repertoire ranging from 78 rpm recordings to Long Play recordings have been included. All the 30 tracks are colorful reflections of her prowess over the Khayal, Tarana, Thumries, Bhajans and Jugalbandis. CD 1 features 13 tracks which were all originally 78 rpm recordings. They comprise Dhrut Khayals, Hori and Bhajans. CD 2 again consists of 13 tracks. Besides Dhrut Khayals and Thumries, it has her Tarana rendition and also a Ghazal. CD 3 is a rendition of full fledged ragas. The album opens with the morning raga Ramkali followed by the evening raga Yaman. The late night raga Chandrakauns and the seasonal raga Basant Bahar have been featured herein as 'Jugalbandis' with her sister Saraswati Rane, an accomplished singer herself. Hirabai Barodekar's music is a treasure trove. We at Saregama, have been the custodians of some of the most enchanting musical experiences over the years. Through this compilation, we wish to ensure that her genius reaches and continues being an inspiration to the future generations of both, music lovers and aspiring artistes.